The University of Minnesota Solar Vehicle Project--one of the first teams to meet all the qualifications for racing in the 2008 North American Solar Challenge--hit the road on July 13 in a 2,400-mile race from Texas to Canada that ends July 22. The team will be posting updates throughout the race. The University of Minnesota is one of 26 international teams competing in designing, building, and driving a solar-powered car in this year's cross-country event sponsored by Toyota. The last North American Solar Challenge was in 2005. The competition began Sunday in Plano, Texas and will mainly follow U.S. Highway 75 and Canadian Highway 1 to the finish line in Calgary, Alberta. 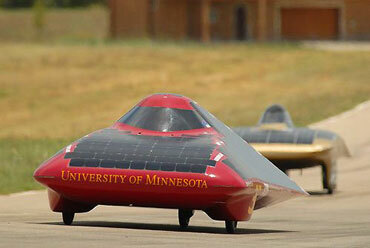 The University of Minnesota's car, named Centaurus, after the constellation, is a completely new generation design from the university's previous seven solar vehicles. The most noticeable change is that the design meets new race requirements for the driver to sit more upright in the car compared to previous vehicles. The car is just over three feet tall, 16 feet long and six feet wide. It weighs about 420 pounds without the driver. The 20 students on the team are all from the Institute of Technology, the University of Minnesota's college of engineering, physical sciences, and mathematics. Team members estimate that they've collectively spent more than 30,000 hours over the last year planning and building the solar car. Materials for the car were funded through cash donations and in-kind donations of parts and materials. After meeting the race requirements some University of Minnesota team members helped other less-experienced teams prepare for the race. "After all, what fun would it be if we were the only team racing?" said team crew chief David Towey on the team's Weblog. "We have been helping out our pit neighbors Oregon State University, a first-time solar car team that was funded out of the team members' pockets. We really admire their dedication."